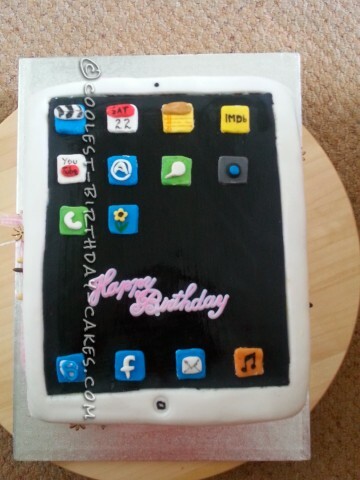 I was asked to prepare an iPad cake for my friend’s birthday. I’ve never done anything like that before. I baked three sponge cakes. On the first I put strawberry jam and covered it with a milk chocolate ganache. On the second I put strawberry jam and covered it with a white chocolate ganache. I covered all the cake with a dark (75%) chocolate ganache. Then I covered everything with white sugar paste. I cut a square in my icing on the top of the cake. I took that part off and replaced it with a black sugar paste. I spent lots of time on preparing all application icons. I know they are not perfect but I’m still learning. Even though the cake in my eyes wasn’t perfect, my friends were very happy with it. They told me it was very tasty too – much tastier than commercial cakes which they buy.